Tony Vance's side have conceded 33 goals in their last eight league games. 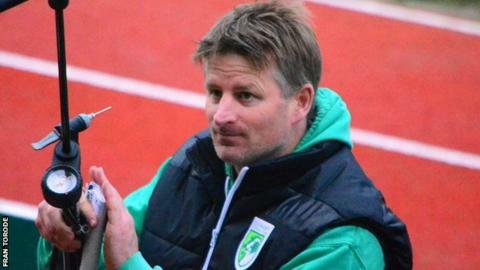 Guernsey FC boss Tony Vance condemned his side's display in their 6-0 loss at Hythe Town as "simply awful". After trailing 2-0 at half-time, the Green Lions conceded four more after the break and have now lost six of their last seven games in the league, their worst ever sequence of results. "The team we had out tonight, we had no excuses," he told BBC Radio Guernsey. "I feel really down because people have committed another Tuesday night, but it's been a complete waste of time." Guernsey last Tuesday and the loss at Hythe ranks as their second-worst result. They have also let in 33 goals in their last eight games. "The first half was still really poor and we deserved to be down. The goals we conceded were sloppy, they were awful," said Vance. "We let everyone down, not just ourselves, but everyone connected with Guernsey FC, it simply wasn't good enough. "I'm a little bit embarrassed really, but that's the way it goes." The result meant Guernsey dropped to 18th in the 24-team Isthmian League Division One South. Vance has had problems fielding a strong team for some midweek away games, but insisted the side he sent out at Hythe was good enough to win the match. "We've got quality players but we're not showing it, particularly on Tuesday nights," he added. "It's a really tough time at the moment. If things aren't going right then you've got to show a bit extra in effort and desire, we had that on Saturday, we didn't have that tonight," Vance added.